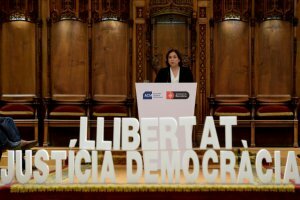 The Barcelona mayor Ada Colau has warned Brussels that the trial against independence leaders can affect the European Union ‘political stability’. In a letter to Jean-Claude Juncker, Antonio Tajani and Donald Tusk sent on Saturday, Colau told them this case should ‘interest’ them as it is not ‘just an internal affair of Spain’ and will have spill-over effects in Europe. For this reason, a group of MEPs have been invited by the Barcelona City Council to follow the trial in Madrid against the twelve Catalan independence leaders charged with calling a referendum and declaring independence in 2017. The Barcelona mayor claims in the letter to the EU institutions that the trial is an ‘abnormal situation’ in Europe not only for the ‘political condition of the defendants’, but also for the ‘serious crimes’ they are accused of. Colau alerts European leaders that if the trial ends in guilty verdicts it will ‘exacerbate division and hamper the construction of a negotiated solution. ‘We cannot ignore the fact that we are faced with a political conflict, and that the best way to address this is by strengthening dialogue instigated recently,’ she says in the letter.